Pleasure Craft Operator Competency requirements are now a reality in Canada. 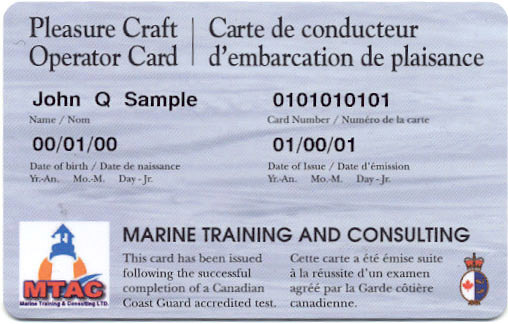 As of 2009 all operators will be required to carry proof of competency such as a Pleasure Craft Operator Card. The PCOC (Pleasure Craft Operator Card) or otherwise known as the Boater Licence is not actually a 'license,' it is 'proof of competency'. However due to confusion by the public, throughout our website we will refer to the Pleasure Craft Operator Card as your Boater Licence. As of 15th April 2011 there were changes to the exam required to obtain a PCOC. The written exam now consists of 50 questions and the online exam requires 3 hours of online study before taking an online 50 question exam. These changes were brought in by Transport Canada to try to better ensure boaters have a basic knowledge of boating safety. How can I get a Pleasure Craft Operators Card? The easiest way to obtain a Pleasure Craft Operators is to take the online course and exam. You can purchase a study guide online for the exam and keep as a useful reference tool. If you are unable to complete the exam online, you can contact one of our agents. MTAC has hundreds of agents right across Canada and was one of the first organisations to become approved by Transport Canada, helping people get their Boater Licenses since 1999.